Thanks for the tip! I know plenty of people that would benefit from this! Wouldn't it still be illegal? I mean you're buying an upgrade so technically you need genuine copy of win 7 to have genuine win 8 upgrade. Wouldn't it still be illegal? I'm sure Microsoft knew about this and they are still allowing the upgrade so that pirates can become their genuine customers. Hi, is there any way to get it done with bootcamp Windows 7 on Macbook Pro ? Apparently I couldn't do it - it asks for a product key (which I don't have). I entered the key from windows loader extreme edition, but it didn't work and I was rejected. You dont even have to spend $40. You can get it for $15 if you go to the upgrade website designed for people who just bought computers. Put in bogus info (purchase date in past 2 months) and blam, code to get it at $15. It didn't ask product key from me. The site asks PC Brand and PC Model. You can enter any bogus info there and get a discount promo code. It asks me for product key too. Care to share which brand/ model number did you put in? Edit: I've tried several other combinations. Apparently it's not about the brand/ model number. Edited by Chacobo, 01 November 2012 - 10:05 PM. Yes, you can get Windows 8 Pro for just $39.99 USD even if you have non-legit pirated version of Windows 7. I'm not encouraging piracy. I'm just stating that it's the right time to convert/upgrade your pirated copy of Windows OS to genuine one. Here are the steps for the clean installation of Windows 8 with the Upgrade license. Download Windows 8 Pro Upgrade Assistant. The file is 5 MB only. It will scan your Windows 7 license. SLIC injection passes the test. Chose the digital download and make payment via Credit Cards or PayPal. You will get your product key after the payment. After downloading the setup files, you will be asked to choose how you want the OS. It's recommended to build an ISO file and burn it to a DVD with built in DVD burner software, if you are upgrading from Windows 7 (legit or non-legit). After burning the DVD, turn off your PC, and set your DVD drive as the primary drive in BIOS. Start the PC and the installation will start. You can format the C: drive and recreate the partition at this stage. Installation is automated and will take a few minutes only. Enjoy your shiny new OS after the installation. Remember, you don't have to backup your old copy of Windows 7 and it's product code. Just backup the DVD of Windows 8 and keep your product code at the safe place. Next time, whenever you need to re-install Windows 8, just pop-in the Windows 8 DVD. Microsoft would never mention that you can upgrade on pirated copy. But it's confirmed that if your copy of Windows 7 is activated with SLIC injection or any other similar method then you can upgrade. Just install the Upgrade Assistant and try yourself. how to put the upgrading win 8 into win 7 dvd ? Edited by Bouncy Ola, 07 November 2012 - 05:35 PM. You won't have to install Windows 7 again if you ever need to format your PC in future. Just use the Windows 8 DVD, enter your code and install the OS. Once you go through the who are you, what wireless / network screens and you get through the logon screen. DO NOT reboot! Do not repair. This can install additional copies of the Apple drivers and further send you into frustration. And in the end you will uninstall anyway. Insert your Boot Camp CD and run the installer. Make sure that you select the default boot OS, if that's your thing. Also check the Apple Updates if you are using an original Boot Camp CD. I might suggest creating a new one from the iOS side of the PC since it will download the most recent version. I entered JB Hi Fi (Australian retailer) as the retailer and was approved without being asked for a key. Hope this helps! I have pirated Windows 7 Ultimate, and I purchased the Windows 8 Pro Upgrade. I'm getting the 'Windows 8 has failed installation' error. I tried doing a clean install and it still doesn't work. I tried to reinstall the pirated Windows 7 Ultimate and retried to upgrade to win 8 pro using a usb, and still doesn't work. 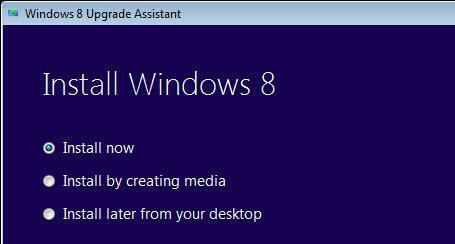 Chose Install by creating media and then click Next on Windows 8 Upgrade Assistant. Save it to your desktop. A Windows.iso file will be created. If there is no Install by creating media option then use the download link from the e-mail. It will install Upgrade Assistant again but you will see the .ISO option this time. Upgrade means not purchasing a new license, but getting a New license by upgrading at a discounted price, from a current version of licensed version. Hence, if you upgrade from a Pirated OS, and you get a New License for Win 8, still there would be a risk of someone asking for the original License from which you have upgraded. 1. Does this still work. Somoene confim? how the **** we create the iso file!!!!???? 2. Don't know but it works with OEM BIOS hack. 3. Don't worry. License test is before the checkout (buy page).